This outfit was so comfortable (I needed something to cover my arm as I didn’t want the sun to hurt my new tattoo so this H&M super lightweight jean shirt was PERFECT.) The rest of the outfit was really centered around what would go well with the shirt. I chose these H&M shorts that I really like (they were in my last post as well, I took the with me to London and I might do so again this year.) They’re a really old pair and they may need replacing soon but I haven’t found any other shorts that I quite like as much. These look good with bare legs but also with a pair of opaque tights (it was a bit chilly here). Otherwise I wore the aforementioned green bag and a white undershirt under the jean shirt. 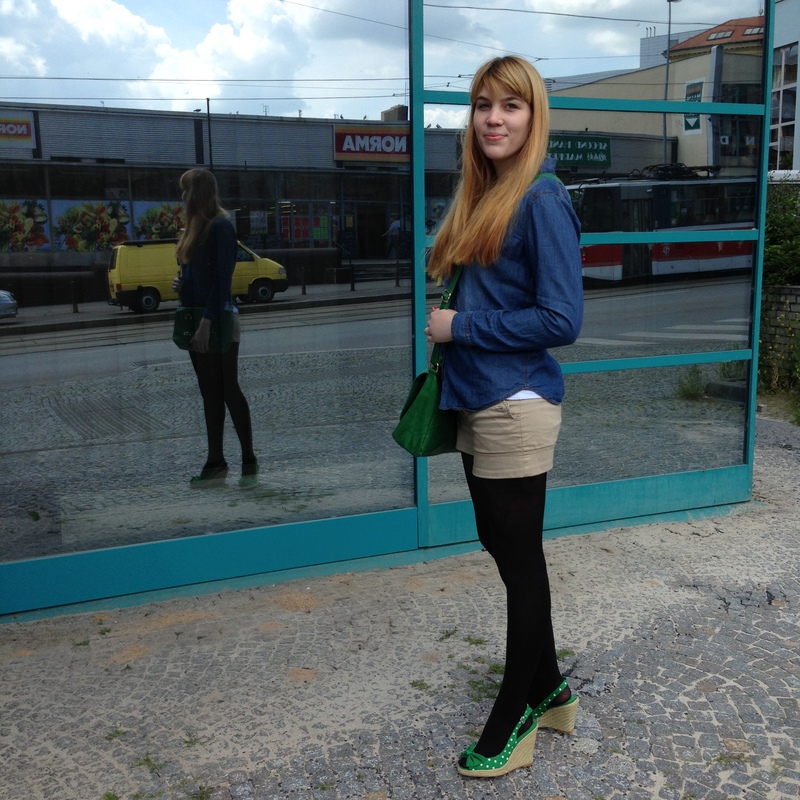 Oh and I also wore a fun pair of summer wedges. They are by Zara and have a cute bow and a fun polka dot print. But back to the shoes. As you see they go equally well with a dress and bare legs as they do with tights (which can be a bit unexpected as they are summer wedges but I actually liked how they looked with tights! But if it had been warm enough I would have preferred to be without tights) and I do like my outfit from the weekend better than the one I wore before though I probably do like the shoes better without the tights for a more summery look. I love the bright green color and the bow is adorable as are the polka dots. I remember I bought these shoes in the sale and I don’t usually like “summer” wedges (or cork wedges either) but the color captured me and I’m really glad I have them.